Please join us for “Peril and Promise”, the sixth film of this six film series on Monday, April 25th in the Nessmith-Lane Assembly Hall from 7:00PM to 9:00PM. Attendance verification will be provided. This event is FREE and open to all. 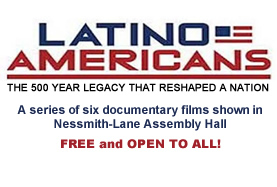 This series of six documentary films chronicles the rich and varied history and experiences of Latinos, who have for the past 500-plus years helped shape what is today the United States and have become, with more than 50 million people, the largest minority group in the U.S. It is a story of people, politics, and culture, intersecting with much that is central to the history of the U.S. while also going to places where standard U.S. histories do not tend to tread. Latino Americans relies on historical accounts and personal experiences to vividly tell the stories of early settlement, conquest and immigration; of tradition and reinvention; and of anguish and celebration, from the millions of people who come to the US from Mexico, Spain, Puerto Rico, and countries in Central and South America. The six series are: Foreigners in their Own Land: September 22; Empire of Dreams, October 13; War and Peace, November 17; The New Latinos, February 3; Prejudice and Pride, March 10; and Peril and Promise, April 25. This is a free event open to all. The list of all of the films in the Latino Americans series is available here.